We are conducting a survey of community attitudes towards the Library's collection and creation of digital content. The survey will take you around 10 minutes to complete and your responses will greatly assist the Library's future plans and activities. Surveys must be submitted by Tuesday 10 November 2009. Good news for genealogists who want to see family sites in farflung places. Suitcase History: Life on the Limestone Plains: "Come along to a library based workshop exploring how to tell the stories of early rural Canberra, where to find information, handling items from that time, and examining attitudes to life in the Victorian Age relating to this region. Storyteller/teacher Elizabeth Burness will share her collection of books, artefacts, including antique clothing, and, of course, stories. She will answer questions in a lively, interesting and sometimes unusual way! Click here to book online or phone 6205 9000. Interesting article http://blogs.manly.nsw.gov.au/manlyfamilies/2009/10/mutch-index.html on The Mutch index from Manly Families. Whether it's the journey of a lifetime or one of your regular jaunts to catch up with family and friends you can indulge your hobby/passion/mania for family history with your next trip to the UK. As well as visiting repositories and cemeteries attendance at Genealogy events will enhance your experience. GENEVA, an online calendar of GENealogical EVents and Activities provides an exhaustive list of links to fairs, talks and conferences. Having perused the list I feel like jumping on a plane right now. I will certainly consult the list before making my next excursion. Thanks to http://wanderinggenealogist.wordpress.com/ for this link. Borrow a person from your library in Lismore! A handy guide for those genealogists like me who have drawers filled with mysterious tangled cables. I have now joined a few waves for educators and genealogists and hope that there will be some cross fertilisation of ideas between these two areas of interest. The platform is quite easy to use if one refers to cheatsheets etc and there are plenty of these around on the web. It is certainly no more difficult than Wiki creation and editing. Yesterday I took the plunge and created my first little wave, it's really a ripple, but I hope that one day it's effect may be tidal. Pasted below is the content from that first effort. I have made the wave public so hope to be collaborating soon. I am seeking others with Google Wave accounts who have an interest in this topic. This is a place where genealogists from downunder - with roots from all over the world can collaborate. 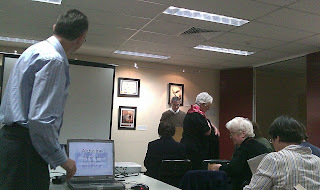 Contributions from others with interests in Australian Genealogy are also most welcome. I see this Australian Genealogy and Family History wave as an umbrella wave from which we can link to other waves about Australian Genealogy eg State or Locality Based, Name Based, Society Based. It is hoped that we can have sections for those who can do Lookups/Offer Assistance, Lists of our favourite resources (both free and paid), News of Events. I will set up some headings below and ask that participants add and edit the information under those headings. Please do not be offended when I move/edit your contributions as I try to maintain some semblance of order in this wave. Hi A general discussion area and sandpit for genealogists. Please add any general comments or discussion below this box and we'll keep the area above relativley tidy!! It appears that the folk in Blayney, NSW are preparing to publish. If you have connections with this area you may wish to contribute. Thomas MacEntee read my post about Google Wave and invited me to take a ride with he and two other genealogists from the US - so I am now riding - rather precariously - I'll just hang on tight and see where it takes me. Tamura Jones also found me so I was able to invite him to the wave started by Amy Coffin. Hopefully some Aussies with a wave account will find me today. Laura Wilson also made this comment on my post "For web conferences you should try http://www.showdocument.com ,Great for online teaching and collaborating. I use it for working on my designs with other in my field.Its free and pretty simple - you just upload your file and invite others to view it together. And all this happened while I was dreaming. I finally got myself a Google Wave invitation and am itching to try out this new communication tool. So far my only contact is the young man who sent me my invitation and we don't have many common interests. I would love to ride a wave with others who share my interest in family history in Australia. Good advice from Australian Tapgenie on her Twigs of Yore blog. Thanks to Neil Chippendale (Local Studies Coordinator) and Hornsby Library staff for organising this evening's Family History Seminar "How to trace your Irish Ancestors". 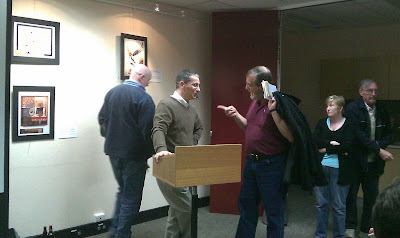 The event was booked out days ahead resulting in a capacity crowd for the library meeting room. Presenter, Jeremy Palmer, gave an interesting introductory lecture on this topic. It was obvious from the reaction of some audience members that quite a number of attendees were unaware of the resources discussed and the history presented. The seminar certainly filled a need for many of those present. A reunion in my Mum's home town, Cobar. A book for the reading list - especially for those of us with Scottish roots. Genealogists do you need some images to enhance your webpage, blog, presentations? It is often difficult to find copyright friendly images for this purpose. This wiki provides links to collections of images that may be used. Although intended for education there are many sites with images relevant to family history. This song posted on Youtube written by educator, Joyce Valenza, and performed by her daughter, Emily expounds the value of 2.0 style databases. It's what genealogists want too. Just came across this story of a beautiful old church in a small country town. Genealogists - be wary of sharing personal information on the web, remember to supress details of living persons on your family sites. I have retired my old Smartphone and am now the proud owner of a new HTC Touch Pro2 from which I can read the newspaper, access my mail, my genealogy data and a plethora of online information. I remember my first mobile phone in 1993 - it cost a fortune and was so heavy that I had difficulty carrying it in my handbag, I also carried one of the early PDAs and a camera that used film!!! Now I just carry the one little multifunction device. This video about the convergence of media, although it has a US bias, makes me wonder what we Australian Genealogists will be carrying in another 15 years time. My keyboarding skills are woeful. In the olden days I had a secretary to do my typing and I have never mastered that skill. The OCR on my flatbed scanner is not the best and I don't always take my scanner along when I go travelling so I was pleased to hear this news from Google Docs.